October 2 is celebrated as Gandhi Jayanti and many rejoice Bapu’s since it is a national holiday. But little do we know that Mahatma Gandhi’s birthday is shared by another very important man and a leader. All of us are aware of the country’s first Prime Minister Jawaharlal Nehru and his birthday but do we remember our second prime minister? Lal Bahadur Shastri was not only the second prime minister but also the man behind the revolution of the agricultural sector in India. 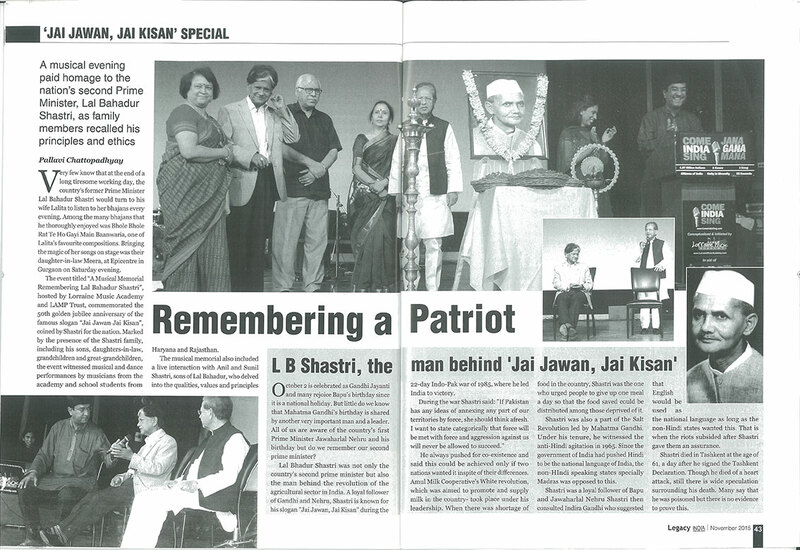 A loyal follower of Gandhi and Nehru, Shastri is known for his slogan “Jai Jawan, Jai Kisan” during the 22-day Indo-Pak war of 1985, where he led India to victory. He always pushed for co-existence and said this could be achieved only if two nations wanted it in spite of their differences. Amul Milk Cooperative’s White Revolution, which was aimed to promote and supply milk in the country, took place under his leadership. When there was shortage of food in the country, Shastri was the one who urged people to give up one meal a day so that the food saved could be distributed among those deprived of it. Shastri was also a part of the Salt Revolution led by Mahatma Gandhi. Under his tenure, he witnessed the anti-Hindi agitation in 1965. Since the government of India had pushed Hindi to be the national language of India, the non-Hindi speaking states specially Madras was opposed to this. Shastri was a loyal follower of Bapu and Jawaharlal Nehru. Shastri then consulted Indira Gandhi who suggested that English would be used as the national language as long as the non-Hindi states wanted this. That is when the riots subsided after Shastri gave them an assurance. Shastri died in Tashkent at the age of 61, a day after he signed the Tashkent Declaration. Though he died of a heart attack, still there is wide speculation surrounding his death. Many say that he was poisoned but there is no evidence to prove this.